You waited until the last two hours before your big test or assignment to start studying and now you’re in a frenzy trying to memorize all the material or write down words that make at least some sort of sense. Welcome to college student procrastination. Whether you want to admit it or not, I’m sure you’ve felt the anxiety creep up on you at some point when you had to cram for a test because there was just never enough time to fit one more study session into your schedule. I get it… Procrastination is REAL in college and I was a complete victim to it for awhile myself. Although I haven’t completely overcome my procrastination (I’m trying! 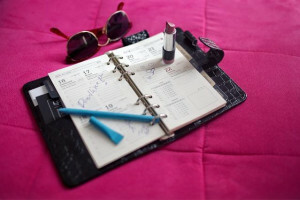 ), I have found some great solutions for managing my time better. In addition to that, I’ve also learned how to make the most of the procrastination situations I put myself in. I became a master at this as a college student and although I don’t encourage you to wait until the last minute on ANYTHING, I know that it’s going to happen and you’ll need some guidance to get you through. 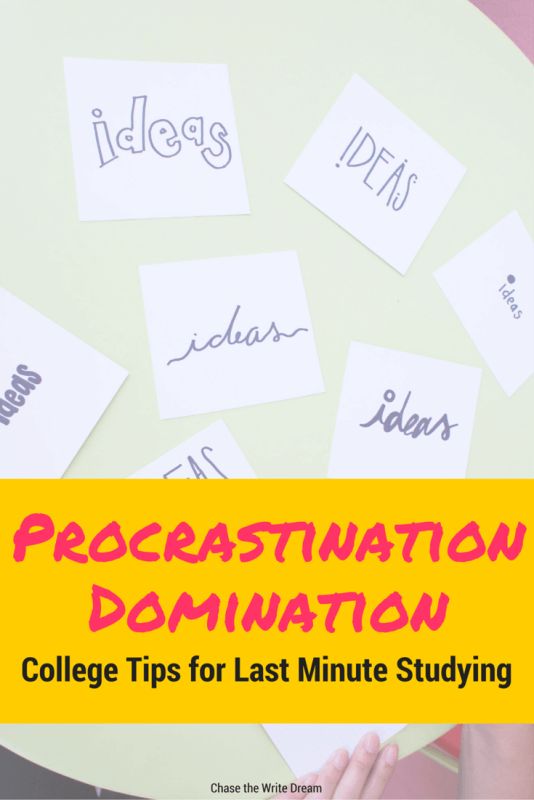 So here it is – My college student procrastination tips for successful last minute studying! P.S. I have a few different posts specifically about studying, so make sure you check those out and use those tips in the future! This one is simple. The hints could be in the form of a study guide, things they’ve emphasized in class, or definitions/terms they want you to know. These “hints” are your cheat sheet for setting up a quick study session. Instead of trying to memorize everything, you’re going to stick with the main points and absorb as much of that information as possible. So many college students procrastinate on their reading assignments and fail to get through the entire text by the time a test rolls around. I know those chapters can be super time consuming, but they may be filled with really important material! If you’ve REALLY procrastinated, then you might not even have time to jot down the quick summary, but at least you’ll have some sort of idea about what was talked about in the reading. If you know that definitions or key terms are going to be on your test, write down any relevant information and then read it to yourself over and over at least seven times. Have a little extra time? Rewrite what you wrote instead… You’ll have a better chance of retaining the information for a longer period of time and should have a better understanding of it. If you’re a visual learner, try drawing a quick timeline or chart to help you organize the facts and thoughts that will be questioned on your test. By doing this, you’ll help your brain picture how various details are related, hopefully triggering something in your memory that allows you to accurately identify information once you’re taking the test. For example, if you draw a mind map or chart, you would be a main idea in the middle and then branch out smaller ideas from that. So, if a psychology student is studying psychoanalysis and they use the branches to name related theorists, brain activity, and popular experiments, they now have a visual to recall rather than an entire chapter of reading. Consider it summarizing with art! Look, you can’t take back how long you procrastinated. The test that you’re about to take is going to happen whether you’re ready or not, so you might as well prepare yourself as best as you can. What are your biggest struggles with procrastinating? It’s nothing to be ashamed of… We’ve all been there! If you don’t mind, I’d love to hear your thoughts in the comments below. You could share what struggles you have, how you’re dealing with them, or anything else! This really helped me because last night I was crying because I’m so stressed about my finals. I have a Chem bio and trig final. I did this to myself so I have to do better. But I need to take a bio test today and I’ve procrastinated so much on study for it. It’s a lab practical but the labs I always get A’s on. It’s just remember the material! But these tips have really helped me and I am definitely going to come back and use them and study AHEAD of time! Thank You! I’m SO glad you found them helpful, Emily!!! Wishing you all the best as you go through your finals!